This adult, non-fiction book is based on mental health and illness. It is well thought out, wonderfully presented, simple and yet informative, a reference for everyone, without the stuffy terminology, which the author has been able to ‘define and describe’, deceivingly effortlessly. It also includes real stories by real people, including one from the author, who on a daily basis are challenged by mental health issues, whether directly or indirectly, to seek an avenue that can lead to a happy and fulfilling life. Essentially there are two parts, the daily, real life struggle and the ‘define and describe’ reference. This little pocket sized book is designed to help the reader understand the basic differences between the more common mental health problems, which in turn should provide the much needed information to create accurate community awareness. The real stories will in turn, give a real insight into how life can be for so many people. The biggest challenge faced by people who survive or suffer from mental illness is the ignorance of the community and even those in their immediate environment, making his or her work life, social life, school life and/or home life quite unbearable and suffocating. The content will keep the reader thinking and reflecting for years, bringing about the motivation to share his or her thoughts with others. 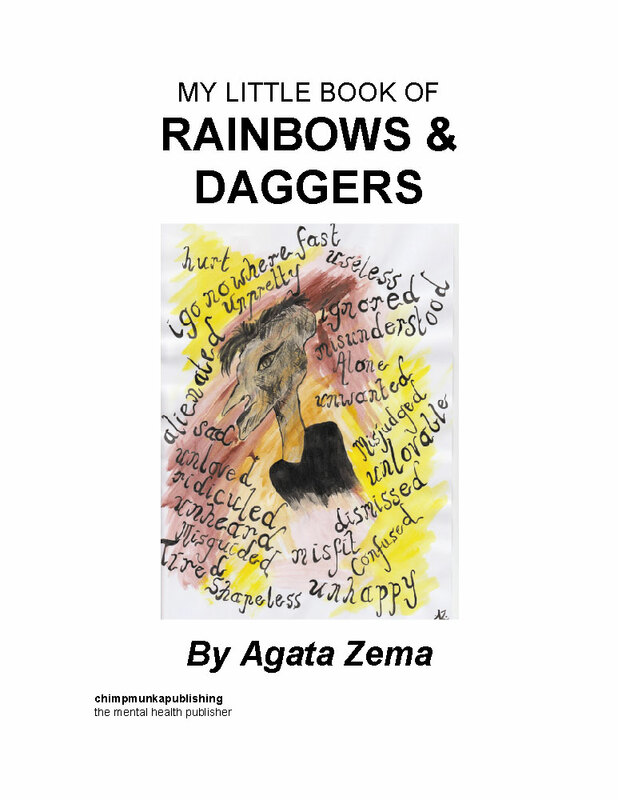 Agata Zema is passionate about mental health and associated problems. She has shared one of her own stories in this book. At the time of writing this book the author lived and worked in the Sunraysia Region in North West Victoria with her partner, son, and two dogs. Agata is a counsellor, qualified in counselling & psychology and criminal psychology. I got thin without realising it. And then I got really skinny the same way. I was too busy taking in the new world around me. All strangeness and familiarity disguised as ‘secondary college’. I was twelve years old and in my first year at a local Mildura school. My home room teacher was fond of an activity that involved each student to draw a piece of paper out of a ‘hat’. It was a get-to-know-you exercise in which one side of the piece of paper had a name of a student written on it and the other side was blank. We were expected to write something ‘nice’ on the blank side about the named student and immediately return the piece of paper back to the teacher. For some reason girls found this task a lot easier to perform than the boys, no matter if the recipient was male or female. Also the boys would express their compliments in such a way that it was almost funny, like ‘You seem ok’ or ‘You have a cool brother, he plays great football’ and so on. The girls would write their message in curly writing with flowers for the dots in ‘i’ and draw smiley faces like. A compliment from a girl took on the form of ‘I love your hair, how do you get it so shiny?’ or ‘you seem to be really good at sport’. Every student pretended that this get-to-know-you activity was as boring as a maths class, but secretly we all enjoyed the anticipation and kept the pieces of paper as if they were miniature love letters. One day that all changed for me. ‘Anorexia’ is read, in very neat hand writing. I later found out that that hand writing belonged to the teacher. It was a bit hard not to see the similarities of the writing on the whiteboard and that of the ‘compliment’ note. I was so embarrassed, I had no idea what that meant. I made up something trivial at the time to pass onto my new friends in class. It was the ‘done thing’ to pass on the anonymous message to friends. Comply or forever be left behind. We all wanted to make and keep friends; after all, we were new students attending a new school. Because of that one word, that one secret word, I already felt singled out and different. It carried a weight that was too heavy for me. I had to find out what that word meant. I did. At lunch time, I did the unthinkable and visited the library while my friends watched the boys kick the footy around the oval. I read and reread the meaning and the small amount of literature that was known about the disorder at the time. I immediately thought that it is not me. I should not be ridiculed like this, my body, my business. I did not ask to be judged. Or be suddenly thrust into such confusion and frustration because someone could not mind their own business. Why not tell me face to face, at least we could have talked about it.